BrainFizz - Routing, Making, Custom projects & Training. 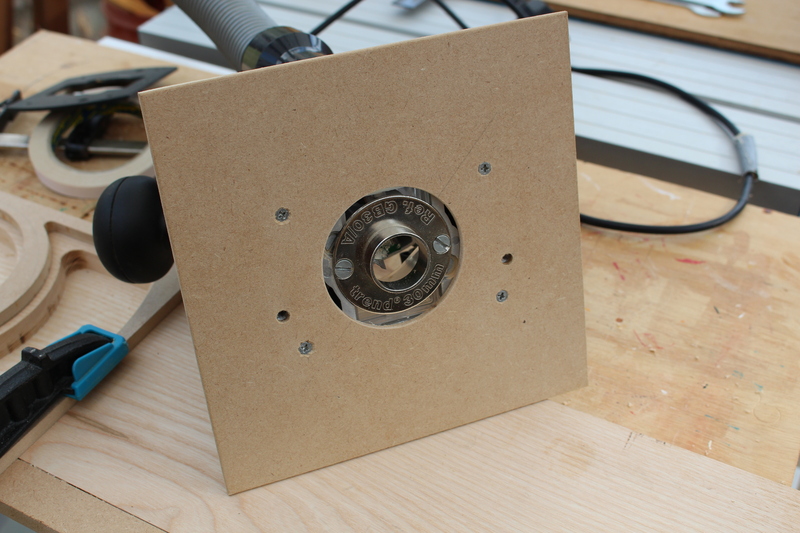 : Routing 101 progress: Using a router for oh so many jobs! Routing 101 progress: Using a router for oh so many jobs! Whilst I enjoy very much making the videos, it's never as much fun as actually doing the project the video is about! I also decided to take several pictures along the way, people seem to like pictures more than actually read pages and pages of tedious script it seems! So, if you've been following my YouTube channel, you'll already have seen the videos that are out. 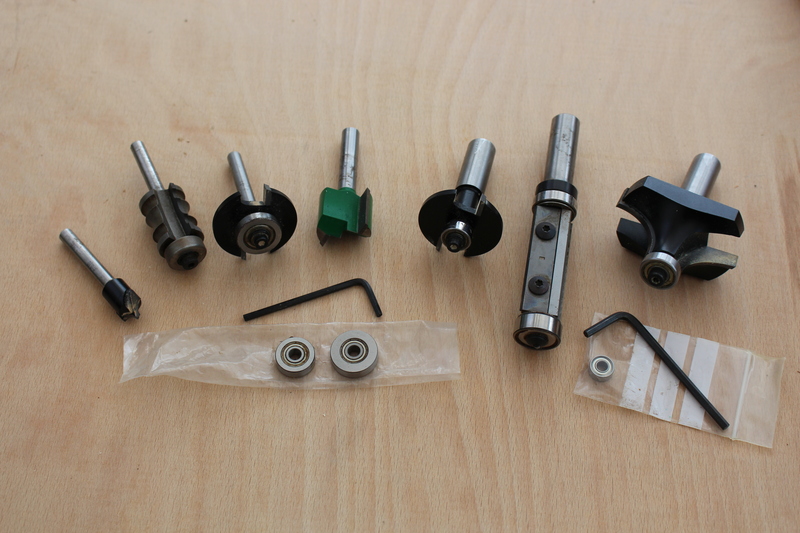 Small selection or cutters, 1/4", 8mm & 1/2" shanks, with various purposes. 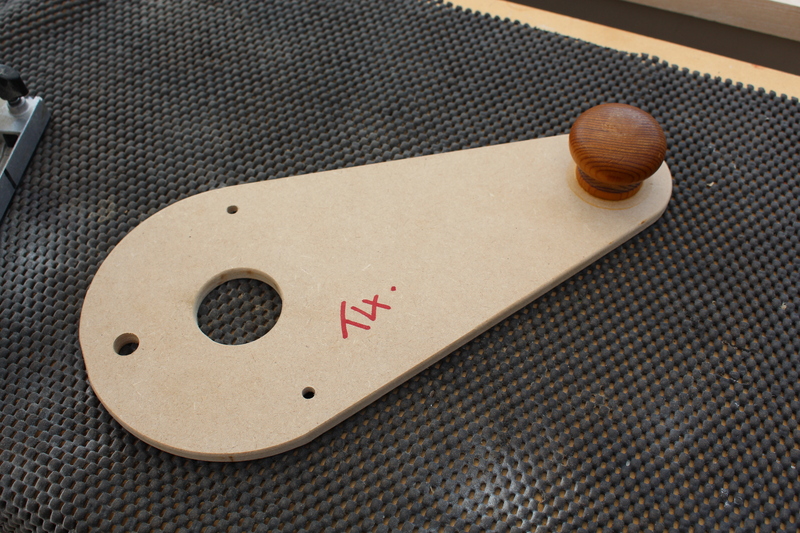 In Episode 1, I go through what are, in my own opinion, important considerations to be made when looking at the investment of a handheld router. Interestingly I completely forgot to mention to pick a router that plunges! This was because firstly, here in the UK, tiny routers that don't plunge are basically laminate trimmers. But also, I was kind of thinking " why WOULDN'T you pick a plunge router?!??" I thought it was important that I take some time to go through the process of caring for and storing those expensive cutters we all seem to collect. There seems little point spending our hard earned money on specialist router cutters, only to let them go rusty and throw them in a drawer to bump into each other and ruin the carefully honed carbide tips! Routing 101 Episode 2: Router collet and cutter care. Whilst I was deciding on what to cover in what was fast becoming a series, rather than my initial plan of maybe 2 short videos, it very quickly dawned on me that I was entering into a topic which was far more involved than my initial idea of "lets do a router video". Of course when I say "I was deciding", what I really mean is "reading all the brilliant ideas and suggestions of my friends and followers on Keek! As quite frankly, they have all been great throwing in ideas and providing continued support and encouragement. Routing 101 Episode 3: Edge moulding. After 2 videos of me just spouting out things about routers to my mobile phone on a tripod (OK, so the advice and things covered is sound, but it still just felt like talking to my phone), I decided it was time to break out my small router. [At the time of writing this post, I have no affiliation with any manufacturer or brand in any way at all] The router used in the videos is my Trend T4. 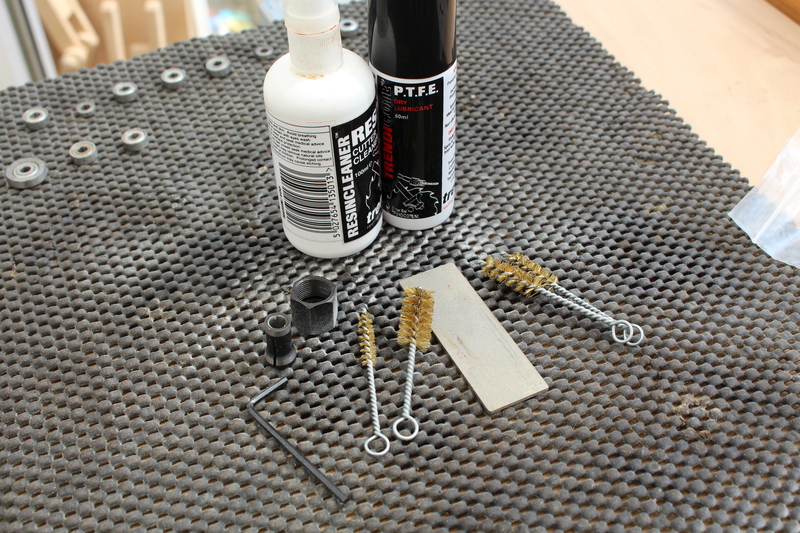 I love this manufacturer not only because of the way the kit works, but also the fact that I can pick up the phone, call the tech guys and have a solution or part number in about 5 minutes. The part number can then be given to my local retailer and the spare part (ANY spare part) shipped overnight and collected the next day! Something you can't say of all manufacturers! The amount of material removed on roundover/cove cut of equal radius. During the filming of episode ,3 I talk about making a round over cut in one pass, but the same is not always possible with all edge moulding. I tried to show the above piece of timber, but it didn't show that well. Regardless you can see above that even though the cove and roundover cutters above are the same radius, in fact a matching pair, considerably more material has to be removed. This would mean several cuts at gradually increasing depth to stop burning - particularly in hard and light woods, such as Ash or Rock Maple. Offset bases can be extremely handy when edge moulding narrow timber. Simple edge mouldings can produce subtle, yet attractive details on even the simplest of projects, narrow timbers can be, at times, tricky to route as they offer little or no support to the router particularly large routers with large apertures suitable for use under a table. A simple solution to this is to make a false base with a small aperture and extra handle for additional support. This virtually eliminates the problem of the router tipping and then ruining the newly routed moulding. Routing with templates is a very efficient way to produce multiple identical pieces. The simplest way to route with a template is to use a template profiling cutter such as wealden tools T1690-8 cutter. However not everyone owns such a cutter or uses templates enough to justify one of these more specialist tools. An alternative solution would be to use a simple normal two-flute or spiral cutter with a guide bush. Understanding the relationship between a given cutter/guide bush combination can result in the ability to make almost any size or shape template yourself for almost any purpose. 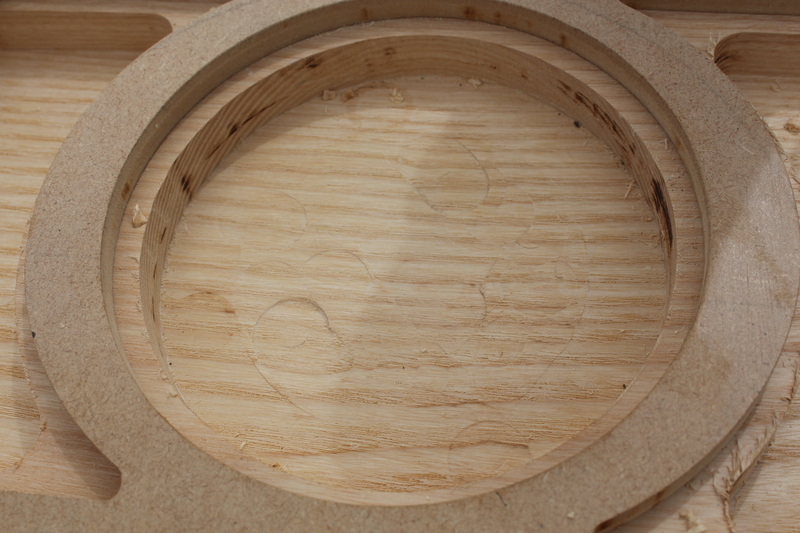 mortising, housings/dados, circles, and even shapes or pictures. Whilst routing large apertures, or across large template,s a large false base can help span from one side to the other and still give full support to the router and thereby providing a clean and tip free cut. 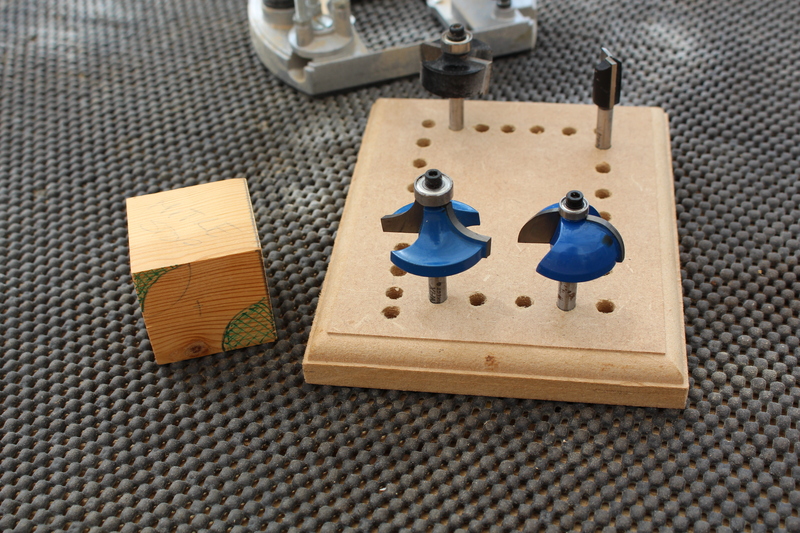 For both the above jigs/work aids a circle cutting jig can be used to cut both the arcs and the apertures.